Atmospheric and trudging Doom/Death Metal, displaying guitar-led songs of epic length. The vocals consist of deep gutturals and depressed female singing, the latter being courtesy of Mandy Andresen of Murkrat. While her contribution to the debut consists of classic/conventional soprano lines, she delivers distinctive mid-range vocals much more reminiscent of her work in Murkrat in more recent albums. Stuart Prickett steals the show with emotional leads and crushing rhythms which seem to take akin to his work with Stone Wings. 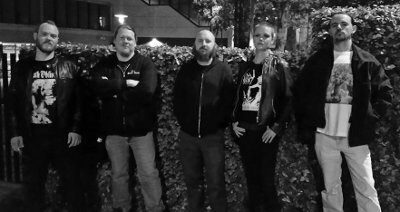 Altogether, their material is compelling and profound music that lies somewhere between Mourning Beloveth, Funeral, and Ahab. Interview with The Slow Death (2017-05-20). Australian-based recording project featuring members of Stone Wings, Murkrat, Backyard Mortuary, Corpsickle, and Pallbearer. The band's original male vocalist, Gregg Williamson, passed away on December 2nd, 2014.